This has quickly become one of my family's favourite meals to enjoy after a grocery run to be sure we have an abundance of fresh vegetables. Making these rolls perfectly takes some practice but it's a fun way to entertain guests or simply set up meal prep for the next day. As for sauce, I looked for something with low sodium and low calories this time around. In the past, I have melted some organic peanut butter and mixed in a tsp of soya sauce for a similar taste. All about getting creative with what you already have in the fridge or pantry! Chop romaine lettuce, shallots and cilantro. Place carrots through a food processor. 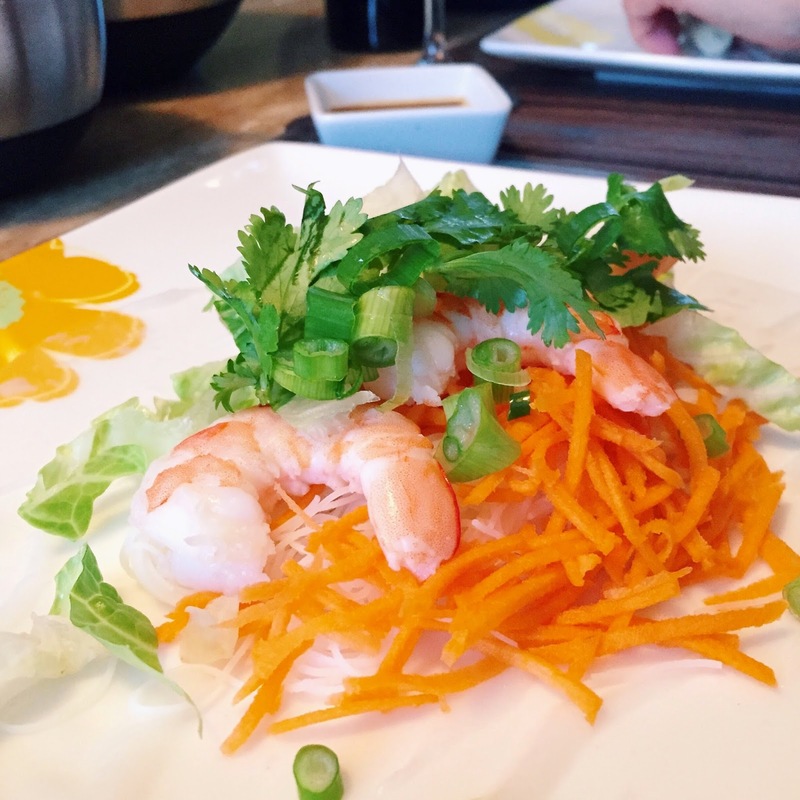 Unthaw cooked shrimp and add each ingredient to their separate bowls. Prepare noodles by placing half the package in a large bowl and pouring in hot water. Let sit for 5 mins before draining or follow package for similar instructions. Bring a shallow pan (big enough to submerge the rice paper) to the middle of the table and fill it with warm water. This will be used to make the paper malleable. Once the paper has softened, add it to your plates, add the desired vegetables and shrimp and fold over the bottom, the two sides and the top. 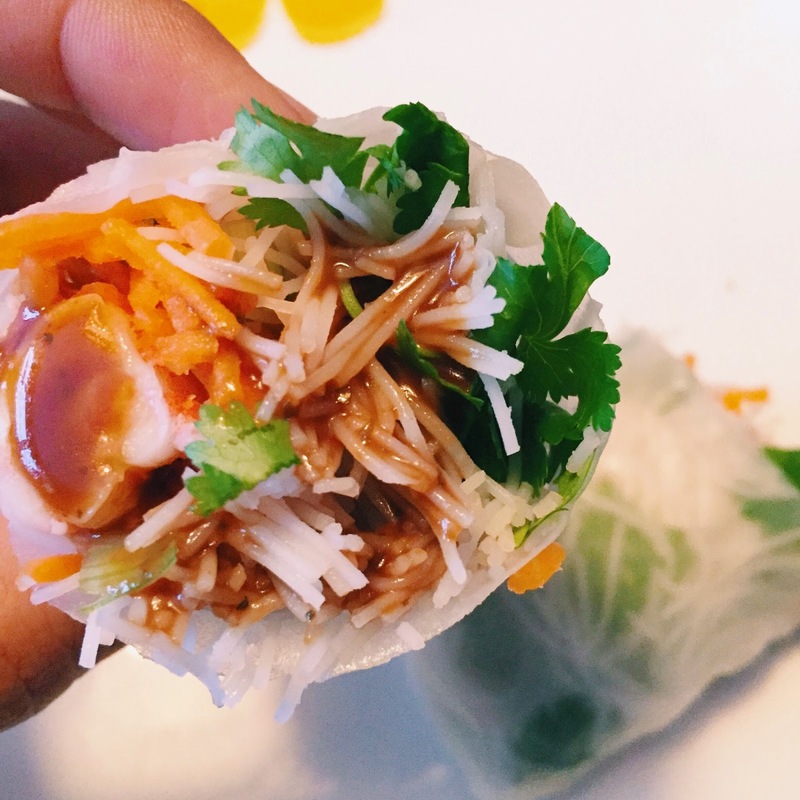 Cut rolls in half and dip into your peanut sauce. Crack open a bottle of wine and get this long weekend started with something light and fresh!